Approximately half of all Asian people are born with an upper eyelid crease. There are also many Asians born with a very low or weak crease who seek double eyelid surgery, or blepharoplasty, to make their eyes appear “bigger.” Did you know that the first published account of Asian eyelid surgery was in Japan in 1800? Wow it’s been over 200 years already! For many actresses and actors who want to add sparkle and brilliance to their eyes in front of the camera, they have undergone some sort of eyelid lift or blepharoplasty procedure. 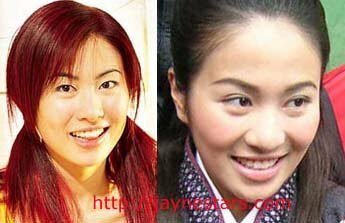 Unlike Korean and Japanese actors whose double eyelid procedures are well publicized, Hong Kong celebrities are more low-key. The exceptions being Leo Ku Gui Gei and Dave Wong Kit; they publicly admitted getting their eyes done. So take a look at the photos for yourself and decide if it’s great make-up or otherwise. In the photo above, it’s easy to spot the difference in Sammi’s eyes over the years. She has an amazing plastic surgeon that did a great job on her face! You have probably always admired Bobby’s eyes twinkling in merriment on TV. Please don’t be distracted by Bobby’s 80’s rocker image. If you look closely at the more recent photos, you will see a marked crease in his eyes not previously there. 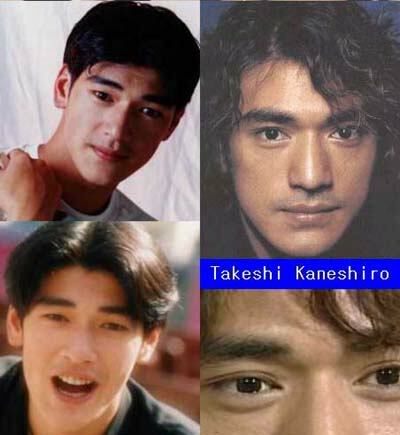 I always liked Takeshi since his debut in Taiwan many years ago. Over time, he seemed to appear more and more handsome. Finally it hit me that his eyes have more sparkle in them now. Maggie always had a beautiful face. But as her acting career got bigger and bigger, maybe she just got a little dissatified with those camera close-ups of her eyes. If you look closely at the first photo, Maggie’s left and right eyes had unbalanced creases; one is more prominent than the other. Years later, both her eyelid creases are perfectly proportioned. Maggie is probably a classic example of using blepharoplasty to make a weaker crease appear more prominent. I know this is not a very good “before” picture of Leo Ku, but had trouble finding really old photos of Leo. Before you blast me, Leo has publicly admitted to getting double eyelid surgery to make his eyes appear sharper. In 2000, Leo went to seek the advice of a metaphysicist and was told that he can increase his luck in the industry by changing his eyes [bigger eyes can create greater affinity with the audience]. Whether it’s the eyelid surgery or sheer talent and luck, Leo is definitely very popular these days. Fiona seems to have much sharper and defined eyes now than when she was in the Miss Hong Kong pageant. Is it just better make-up these days or did she get a procedure to strengthen the crease in her double eyelids? 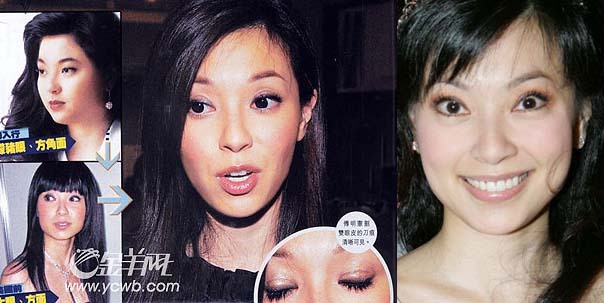 For several years, Michelle has admitted that she used eyelid stickers to create the appearance of double eyelids. But her crease seems more marked these days and her eyes more brilliant. Michelle has always had beautiful features, with or without double eyelids. Like Leo Ku, Dave Wong Kit probably got double eyelids because he wanted to change his luck. 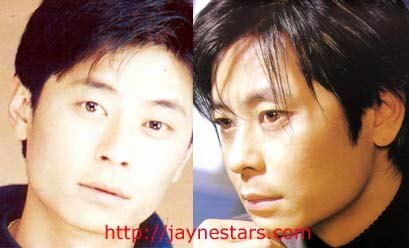 In the 1980’s Dave was a popular singer until the rising popularity of the “4 Heavenly Kings” (Jacky Cheung, Leon Lai, Andy Lau, and Aaron Kwok). Dave had gone overseas for work when the title was branded so he returned to Hong Kong and asked, “Who are the 4 Heavenly Kings?” Dave was misunderstood by the public that he was arrogant and snubbing the “4 Heavenly Kings.” Dave lost popularity in HK and turned his career to Taiwan. It wasn’t until the last 3 years that he’s gone back to HK, wanting to change his luck, he got double eyelid surgery. Dave’s new look doesn’t feature very prominent double eyelids, but just adding enough crease to make them more attractive. 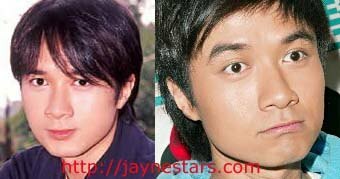 Also, Dave Wong has publicly admitted on a television program that he had double eyelid surgery. If you still remember “Return of the Condor Heroes” starring Louis Koo Tin Lok, you might remember Gigi Fu Ming Hin as his nemesis who cut off his arm. Gigi’s mother was once a famous actress and overall, Gigi’s features are quite pretty. But she was unhappy about her eyes and sought double eyelid surgery to make her eyes “bigger.” As far as I can see, no other work has been done on her face. Gigi retired from the industry several years ago and married into a wealthy family. She is now mainly a socialite and organizes charity events to help dogs. Jayne: The subtle changes in actors’ looks are hard to spot over time. But most people agree that as celebrities’ popularity increases, their looks seem to “grow” on us and they appear more and more attractive over time. Yes the help of professional stylists help a lot, but then there are many who also get cosmetic surgery. to those who made it!